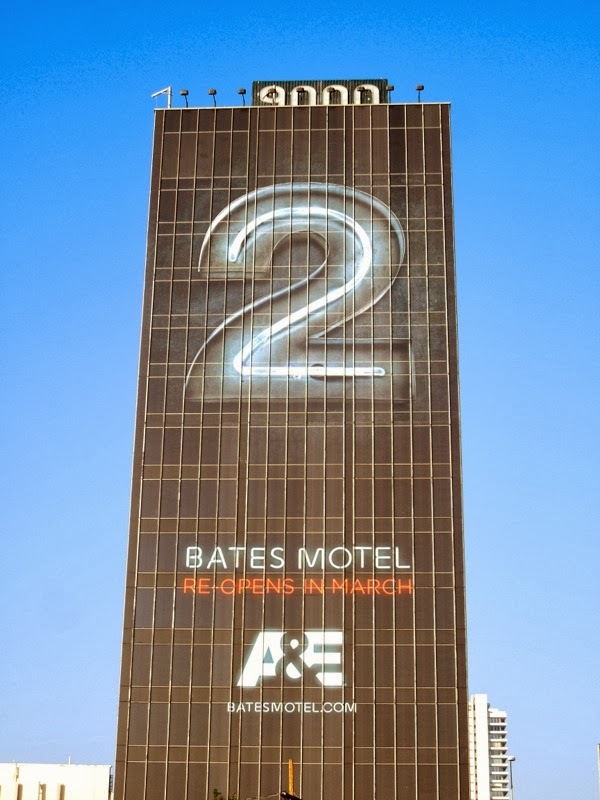 What better way to herald the second day of January 2014 than with this giant neon '2' sign for the second season of A&E's Bates Motel. 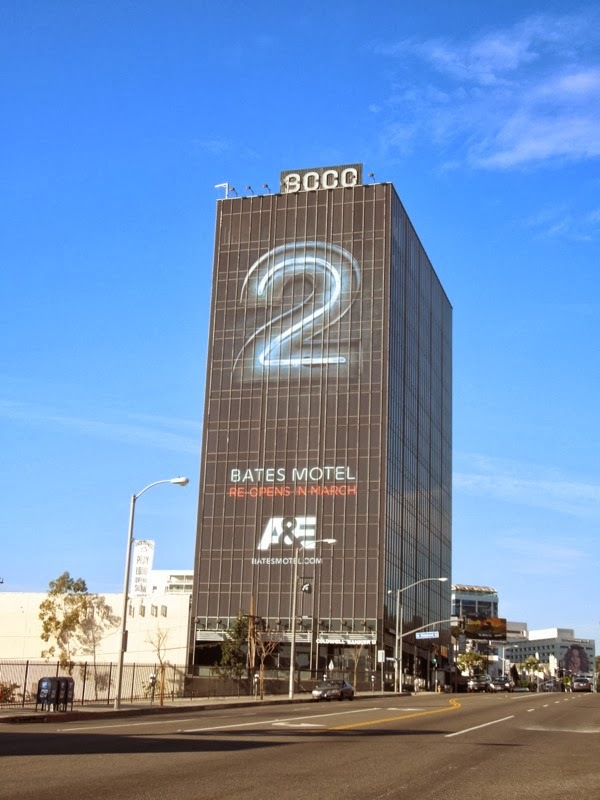 Yes, 'Norman Bates' and his creepy mother are back for another season in this contemporary prequel to the Psycho movie franchise. 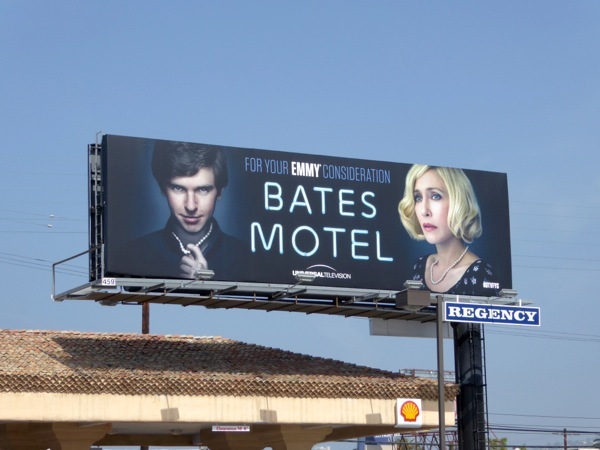 Freddie Highmore reprises his role as the disturbed 'Norman', whilst Vera Farmiga is back as his devoted mother, 'Norma Bates'. 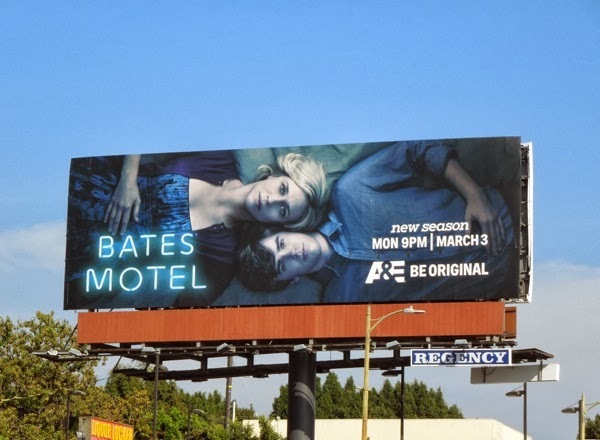 There's nothing like the bond between a mother and her son, and there's nothing like finding out how a teenage boy grows up to be a killer. 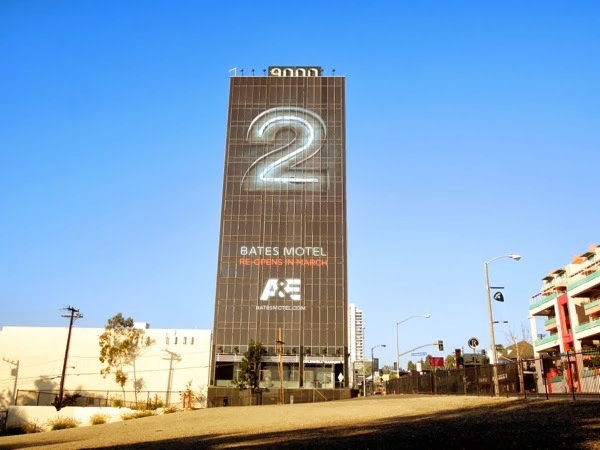 This giant-sized teaser billboard for the second season was spied towering over L.A.'s Sunset Strip on December 21, 2013. 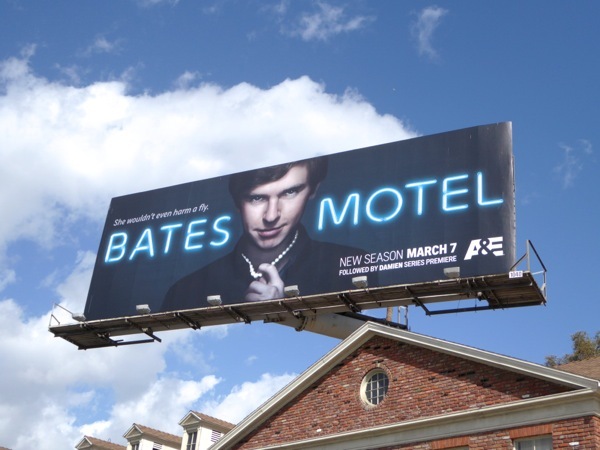 Bates Motel reopens for business in March, but Daily Billboard is sure we'll see more ad creatives for the suspenseful series before then. 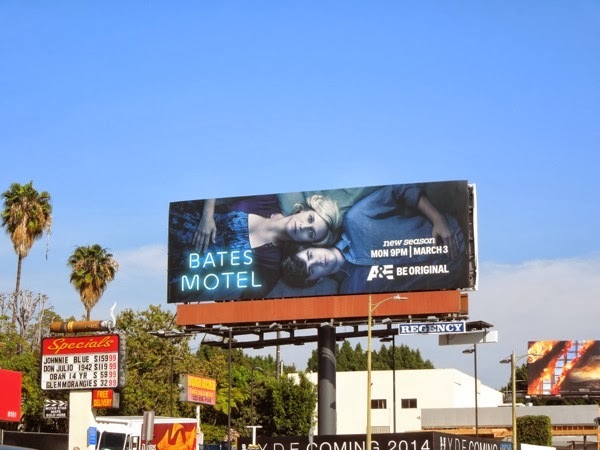 UPDATED: As predicted, here's a new season two promo billboard for Bates Motel, featuring the ever so slightly unhealthy relationship between mother and son with their heads together on a bed, almost like lovers. 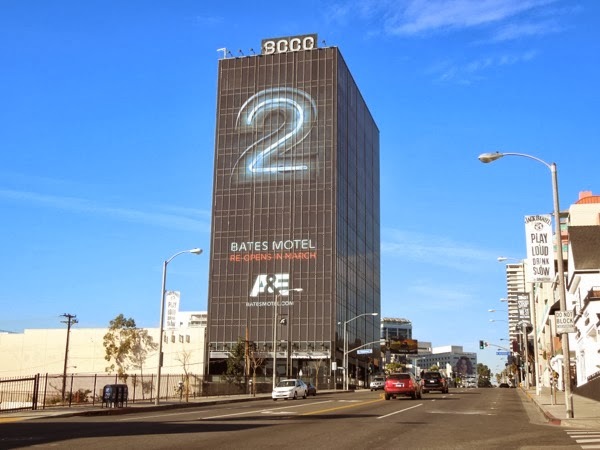 This new artwork for the show's sophomore season of the twisted family drama was snapped along Sunset Boulevard on February 17, 2014. 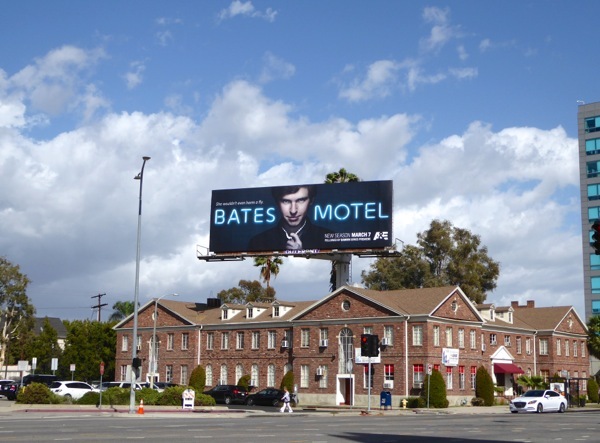 UPDATED: Here's also the creepy fourth season billboard for Bates Motel, where you can see Norman is becoming more like his mother, snapped at the intersection of San Vicente and Wilshire Boulevards on March 6, 2016. 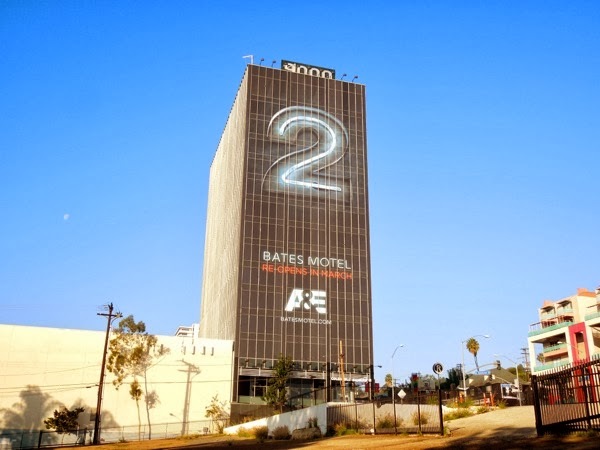 If you're a fan of the show, you can also check out these season three Emmy consideration billboards for Bates Motel filling the L.A. skies during awards season in May and June 2015. 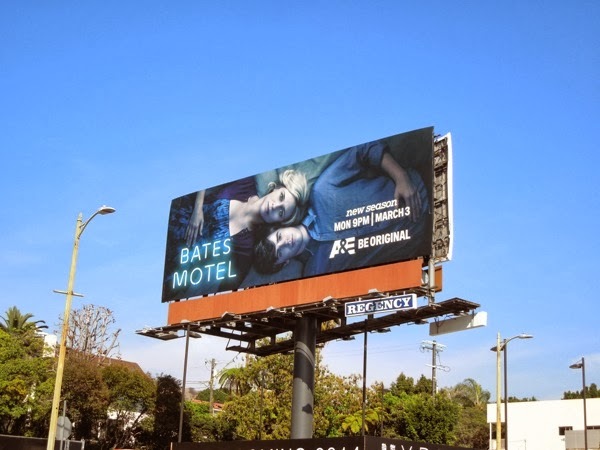 UPDATED: In addition here's also the Emmy consideration billboards for the show's fourth season from both Universal Television and A&E. 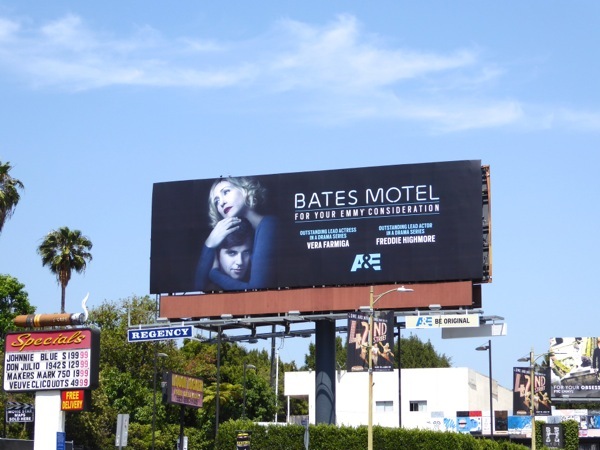 These mother and son ad creatives were snapped along Fairfax Avenue and the Sunset Strip on June 2 and June 6, 2016, respectively.